PRESS RELEASE-SPREAD THE WORD, YAWL!! ALBANY, Ga. – March 29, 2017 — BearManor Media is pleased to announce that Eddie Green: The Rise of an Early 1900s Black American Entertainment Pioneer by Elva Diane Green is a 2016 Foreword INDIES Book of the Year Awards finalist in the Biography (Adult Nonfiction) and Performing Arts & Music (Adult Nonfiction) categories. Eddie Green: The Rise of an Early 1900s Black American Entertainment Pioneer by daughter Elva Diane Green tells the rags-to-riches story of Green’s determination to rise above and triumph against all odds to become a pioneering Black filmmaker, and renowned songwriter, composer, radio icon, and movie actor. In an era when Black entertainers struggled to gain a foothold in show business, Eddie Green rose from poverty to prominence. Green wrote Roaring Twenties blues standard “A Good Man is Hard to Find,” which was recorded by Sophie Tucker, Bessie Smith, Louis Prima, Frank Sinatra, and many others; starred in multiple Vitaphone short films and in 1939 Broadway musical The Hot Mikado; headlined at The Apollo; appeared memorably in two of America’s most popular long-running radio series, Amos ‘n’ Andy and Duffy’s Tavern, and rivaled Oscar Micheaux for honors as a pioneering Black filmmaker. Talent and desire propelled Eddie on stage, over the air, and into films with Louis Armstrong, Lena Horne, Hattie McDaniel, Thomas “Fats” Waller, Jackie “Moms” Mabley, and James Baskette (Uncle Remus in Walt Disney’s Song of the South), Eddie “Rochester” Anderson, and Louise Beavers. Foreword INDIES winners will be announced during the 2017 American Library Association Annual Conference in Chicago on June 24, 2017. 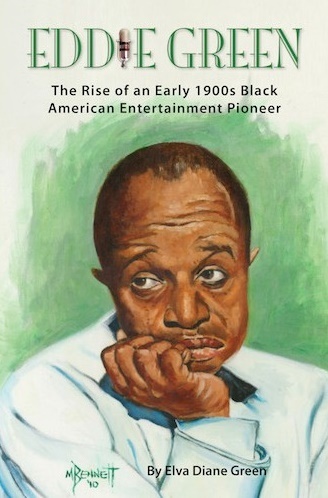 Eddie Green: The Rise of an Early 1900s Black American Entertainment Pioneer ($31.95, 204 pages, 6″ x 9″, hardcover, ISBN: 978-1593939670 / $21.95, 204 pages, 6″ x 9″, paperback, ISBN: 978-1593939663) is available via Amazon, Barnes & Noble, and BearManor Media. Elva Diane Green is the daughter and biographer of Black filmmaking pioneer and legendary songwriter and composer Eddie Green. She wrote Eddie Green: The Rise of an Early 1900s Black American Entertainment Pioneer to prove to her grandson that a person can succeed no matter the obstacles. Elva currently resides in Los Angeles. BearManor Media is the award-winning and Pulitzer-nominated press publishes cutting-edge entertainment books, audio books, e-books, CDs, and DVDs on movies, television, radio, theater, animation, and more. Founded in 2001 by Publisher Ben Ohmart, the BearManor Media catalog now features more than 900 outstanding subjects from the obscure to the eminent. When questioned about his recipe for success, my father Eddie Green said the best recipe that he has for success, is to find what you like to do and do it the best you know how. I decided to write a biography of my father. Once I got into the process of researching this gentleman who died when I was three years old, I found that I liked doing the research. I have the patience needed for this type of project, of course, I have an interest in the subject, and as time went on the information I discovered gave me the impetus to keep searching. I was amazed at how much my father had accomplished in his lifetime that I never knew about. I began to like what I was doing. The book writing idea began back in about 1998, but the serious work began in 2010. I like it and I have done it the best I know how. This week I am signing a contract with a publisher. The very publisher I had planned to contact when I was ready (meaning when I got over being afraid of certain rejection). I have a PUBLISHER. The cover photo is on my previous post and the title is: Eddie Green – The Rise of an Early 1900s African-American Pioneer. Eddie is the little short dude standing next to Mr. Ed Gardner, his boss in the Duffy’s Tavern 1945 movie. I have to point out here, that Eddie and Ed became good friends and I have had the pleasure of being in contact with Ed Gardner’s son. This week I am addressing the proofreading “those wonderful people out there” did for me, and beginning my photo scanning. I am now in a new phase of my book writing project and I will continue to post about it here because, after all, this is why I bought this, my very first laptop. I wanted this blog to be an inspiration to others. I believe it has been judging by my friendly followers. So, stay tuned for more good news! And Thanks! For stopping by.